A stirrup is a light frame that holds the foot when riding a horse. Stirrups are usually paired and are used to aid in mounting and as a support while using a riding horse. They greatly increase the rider’s ability to stay in the saddle and control the mount, increasing the horse’ usefulness to humans in areas such as communication, transportation and warfare. Early stirrups were mainly made by iron, while modern stirrups (such as safety stirrups, ide-saddle stirrups, ect) are mainly made from stainless steel casting with higher grades, such as CG8M or 2205 duplex stainless steel, which has been heat-treated and electropolished or mirror polished to provide top-notch strength and smoothness. In order to improve the rider’s experience and make riding activity easier, designers always try their best to effectively reduce its weight. The perfect stirrup can be used for beginners, professionals and the everyday riding activity. 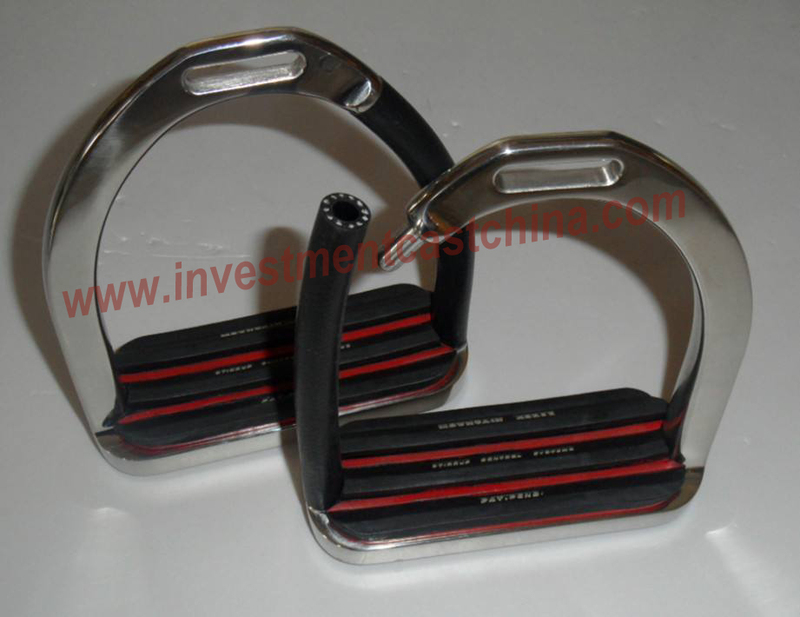 Cast stainless steel stirrup can give strong and durable advantages. Mold is the critical before casting stainless steel stirrups. Like other stainless steel castings, a pair of aluminum mold will be first designed and made which contains a hollow cavity of the desired stirrup shape. A wax pattern is made in the exact shape of the stirrup to be cast. The number of wax patterns always equals the number of stainless steel stirrups to be produced; each individual casting requires a new wax pattern. Hot wax is injected into the mold and allowed to solidify. The resulting wax pattern is an exact replica of the part to be produced. creates stirrups with improved dimensional accuracy, as the mold and casting will cool and shrink together. After casting, finishing operations such as grinding, are commonly employed to smooth the stirrup at the gates and remove imperfections. To improve the strength and harden the stirrup, heat treating (solution treatment) is employed. In addition, to achieve a better surface finish, we can carry out any type of surface treatment methods you like, typically are: electroplishing, mirror polishing, and vibratory polishing. If you have such a stirrup project, and would like to source a reliable casting supplier in China with good prices, pls email cathy.sales01@cnool.net directly.